MATCH REPORT: FC Barcelona 3-1 Alavés: Copa Kings! FC Barcelona claimed the Copa del Rey with a 3-1 win over Alavés at the Vicente Calderón, becoming the first side since the 1950s to win the trophy three years in a row. In a hotly-contested affair, the class of Leo Messi stood out as he scored a fine opener as well as setting up the third goal for Paco Alcácer just after Neymar regained the lead for Barça. It was a scrappy start without any clear goalscoring chances for either side, with the Alavés defence standing firm to Barça intricate passing in the final third. Despite rarely venturing out of their own half, it was Alavés who went closest to scoring in the first 25 minutes. Ibai Gomez, who scored the winner at the Camp Nou earlier in the season, drove in a low shot which squirmed under Cillessen and trickled along the line before going out of play. Though the Alavés backline were doing their utmost to ruffle the likes of Messi and Neymar with some harsh challenges early on, they were helpless to stop the duo on 29 minutes as they carved an opening on the edge of the box with a one-two before the Argentine curled immaculately into the bottom corner for 1-0. Yet, out of nowhere, Alavés drew level moments later, as Theo Hernandez whipped in a stunning free-kick beyond the reach of Cillessen to breathe new life into the final. Just as the sides looked to be heading into the half-time break all square, an excellent team move put Barça back in front. Messi, on the edge of the box, shifted the ball out wide to substitute André Gomes who then laid it across goal for Neymar to tap in from close-range. There was still time for one more at the end, however. Messi is a man for the big occasion, and he was about to stamp his authority once again. With seemingly nowhere to go, the magical no.10 managed to weave in and out of a host of Alavés men before squeezing a through pass to Alcácer and the Spanish striker dispatched expertly. The second half so nearly began in the same way as the first ended, as a delicious cross from Messi found Alcácer but this time his effort was well-saved by Alavés keeper Pacheco. The tempo of the game significantly dropped in the second period, with Barça able to dictate the pace with the two-goal advantage in hand. Alavés, to their credit, refused to give up and came close to halving the deficit on 70 minutes, as a scramble in the box almost ended in Ely poking the ball into the net but Cillessen did well to save at his near post. Seconds later, it looked as though Barça would be in for a nervy ending when Deyverson hit the back of the net from close range but were relieved to see the goal rightly ruled out for offside. In the end, it was a comfortable win for Barça who end the season with silverware once again. 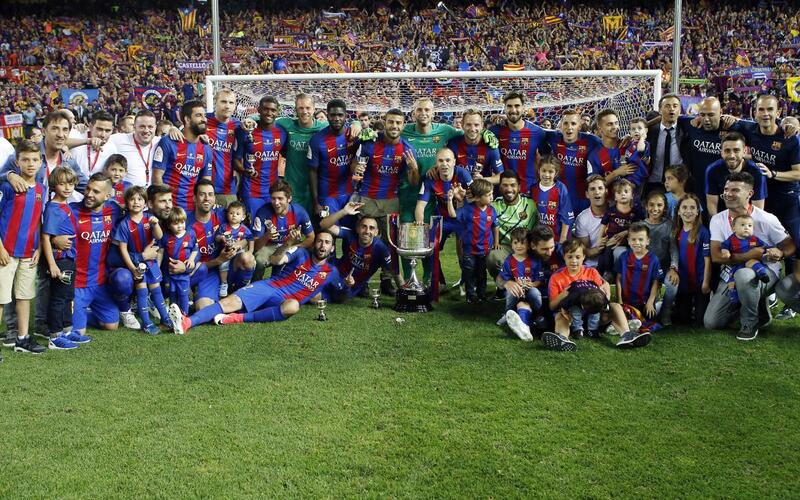 The last team to ever win the cup three years in a row was also Barça, between 1951 and 1953, and the latest success is the 29th in the club’s history. On Luis Enrique’s last game in charge, it was a fine way to bid farewell to the manager who provided plenty of success – a total of nine trophies over the course of his three-year spell.